Reference Publication: Parker, D., Barkaszi, S., Sonne, J., "Measured Impacts of Air Conditioner Condenser Shading," Presented at The Tenth Symposium on Improving Building Systems in Hot and Humid Climates, Texas A & M University, Fort Worth, TX, May 13-14, 1996. A study has been conducted by the Florida Solar Energy Center (FSEC) to examine if space cooling energy savings can be achieved from shading of residential air conditioning (AC) condenser units. The investigation consisted of before-and-after experiments conducted on three homes over a two year period. A recent EPA study recommends shading of exterior AC condensers, using landscaping or other means, as a method to reduce space cooling energy use (Akbari et al., 1992). Direct shading. Incident solar radiation can pose approximately a 1,000 W/m2 load under peak summer conditions to the exposed condenser surface. Temperature depression. The presence of the shade trees or shading devices can potentially reduce localized outside air temperature (through direct shading and/or evapo-transpiration) and hence drop the inlet air temperature to the condensing unit. Estimated savings of air conditioner condenser shading from landscaping have varied from 2 - 10%. The range of the estimates has largely to do with the assumed depressions that could be achieved for the inlet air to the AC condenser. Abrams (1986) speculated that reductions of 1-2oF (0.6-1.1oC) could be achieved. Parker (1983, 1989) assumed that large trees could provide effective shade not only to the air conditioning condenser, but to the adjacent areas and reduce ambient air temperatures by up to 7oF (3.9oC). Field measurement in the same studies showed measured reductions to air temperatures near shrubs and trees of 4-6oF (2.2-3.3oC) , albeit under still air conditions. More extensive landscaping may have larger effects. Geiger (1957) found up to 9oF (5oC) differences between peak temperatures in heavily forested sites, versus those in open terrain and without shade. Measurements in suburban areas have shown 4-6oF (2.2-3.3oC) peak differences between neighborhoods under mature tree canopies and newer developments with no trees (McGinn, 1982). However, still another investigation of the effect of small groups of trees on localized microclimate (Heisler, 1977) showed only small reductions to ambient air temperature (<2oF or 1.1oC), likely due to air movement. None of the studies considered the impact of landscape shading on air temperatures entering a system, such as an air conditioning condenser, which is designed to move a large volume of air over time. In residential air conditioners an evaporator refrigerant temperature of 45oF (280oK) is common. Assuming a peak summer outdoor temperature of 95oF (308oK) and a 25oF temperature difference between the condensing and heat sink temperature, yields a typical condensing temperature of 120oF (322oK). Thus, the theoretical maximum COP for such an air-cooled cycle can be shown to be 8.1. (1) Further manipulation of this equation shows that the machine's COP can be theoretically improved by about 1.4% for each degree F that the outdoor heat sink temperature can be lowered. The situation is somewhat different for real air conditioners, however, since the simple analysis above assumes a constant compressor efficiency and refrigerant pressure drop, as well as no friction losses or inefficiencies in the compression and expansion process. These factors serve to reduce achievable performance. Air conditioner performance in the U.S. is commonly rated as energy efficiency ratio, or EER, rated in Btu of heat rejection per input watt of power demand; COP = EER/3.413 Btu/W). Generally, the EER of residential air conditioners drops by about 1.2% approximately per each degree F (0.6oC) that the outside air temperature increases over the range between 82 and 100oF (27.8-37.8oC) (Neal and O'Neal, 1992). Figure 1 illustrates this effect from the test results from a standard residential unit. The implication for condenser shading is obvious: overall efficiency of typical residential units can be improved by about 1% for each oF or 1.8% per oC that the condenser inlet temperature can be lowered. An additional complication arises from the need to quantify the impact of solar irradiance directly on the exchange surfaces of the condensing unit. Although the peak solar intensity may be approximately 1,000 W/m2, the required condenser air flows which are greater than 600 cfm per ton (>80 L/s/kWt) will tend to reduce the importance of this effect. For instance a typical 3-ton condenser will process 170,000 cubic feet (4.81 x 106L) of air per hour with a total density-specific heat product of 3,060 Btu/oF (174 kJ/oC). If a condenser exposed to mid-afternoon insolation at 1000 W/m2 over a 4 ft2 (0.4 m2) surface with an absorptance of 80% could be shielded from two-thirds (67%) of the incident solar radiation by landscaping, the inlet air temperature depression to the condenser at the afternoon peak would only be 0.2 oF (0.1 oC). Simulating the potential impact of these effects is difficult. Firstly, the change the direct solar influence is inexact given the complex shade pattern of plants and the practical concern of locating specimens close by the outdoor unit without interfering with its air flow. Even more problematic is determination of the ability of localized landscaping to impact the microclimate at the AC condenser inlet. Although the mechanisms through which plants provide cooling are well understood, the actual impact on building level microclimate is complex. Meier (1990) has reviewed empirical studies in a pertinent summary of the literature and Huang et al. (1986, 1990) have simulated most of the major influences of landscaping on building energy use. However, an extensive search failed to uncover any empirical research into the specific issue of AC condenser shading. In spite of the lack of verified performance data, the recommendation to shade air conditioner condensers is often repeated and widely perceived as beneficial (FPL, 1989). Air temperatures, insolation and AC energy consumption were measured in three residential sites for a period of four weeks before and after the condenser was shaded. The experiments were conducted over the course of two summers. At the first site the condenser was shaded extensively with medium-tree specimen landscaping. The condenser at the second site was shaded with a site-built wooden trellis. A third site had extensive landscaping added to shade the condenser and surrounding area. 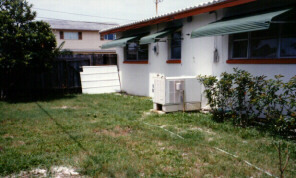 Each site was an occupied residence in Central Florida which had an unshaded, west exposed air conditioner condenser. A multi-channel datalogger recorded AC electrical demand as well as air temperatures, insolation and other weather conditions. Instruments were scanned every ten seconds with integrated values output to storage on a 15-minute basis. Temperature and solar irradiance was also collected one foot away from the condenser inlet. Figure 2 shows the installation of the temperature and insolation apparatus to collect this information by the AC condenser in one of the experiments. Figure 2. FSEC research engineer, Jeff Sonne, adjusts a pyranometer leveling base on the apparatus used in the measurement of condenser air and insolation conditions at site 2 (left). 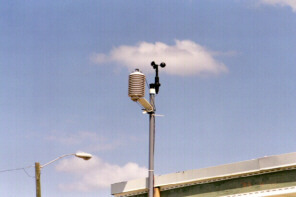 Example of a roof top meteorological station (right). Temperatures were obtained using differential-voltage calibrated type-T copper-constantan thermocouples with a relative accuracy of 0.05 oF (0.03 oC). 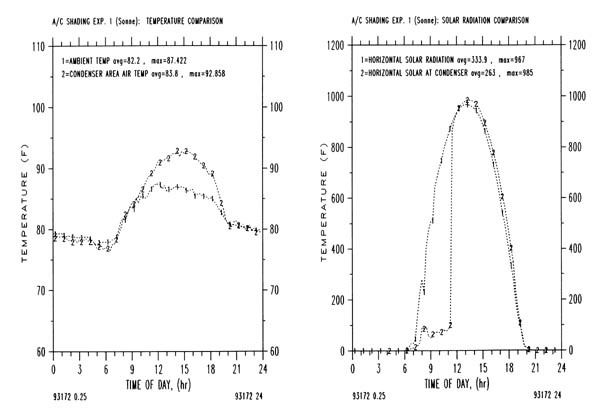 Special attention was given to proper shielding of air temperature probes to minimize experimental error associated with the influence of solar radiation (Sonne, et al., 1993). Insolation was measured using two calibrated silicon cell pyranometers with a relative accuracy of 3%. One was located on the unobstructed roof top and the other placed by the outside condenser unit. Wind speed was provided by a cupped roof-top anemometer. AC power was measured using a true watt-hour transducer with a measurement accuracy of 2.0% RMS. Each evening, the data were transmitted from the measurement sites via modem to a main-frame computer. Data were then automatically plotted for review by a project engineer the following morning. A sample of the 15-minute daily data collected in the project is shown for site 1 in Figure 3. Figure 3. 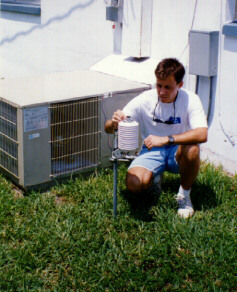 Sample daily 15-minute data for June 21, 1993 at site #1 during the baseline data period prior to landscape changes. Note the elevated temperature at the condenser inlet during the afternoon relative to other hours. The intent of the data analysis was to compare the AC electrical use and ambient to condenser inlet temperature differences on days with similar weather conditions in pre- and post-treatment periods. Differences in afternoon solar insolation on the condenser surface would also be compared. These differences would then be used estimate the impact of condenser shading on cooling performance. An uncertainty analysis was undertaken to calculate measurement error (Kline and McClintock, 1953) as well as to evaluate experimental results to isolate statistically significant effects (Baird, 1995). It was expected that the primary source of data for evaluation of the experimental results would be the temperature depression achieved at the condenser air inlet pre- and post-shading. From previous research, it was apparent that occupancy related variations (internal heat gains and door openings etc.) would make changes in measured AC electrical consumption less robust for isolating the smaller impacts of condenser shading. 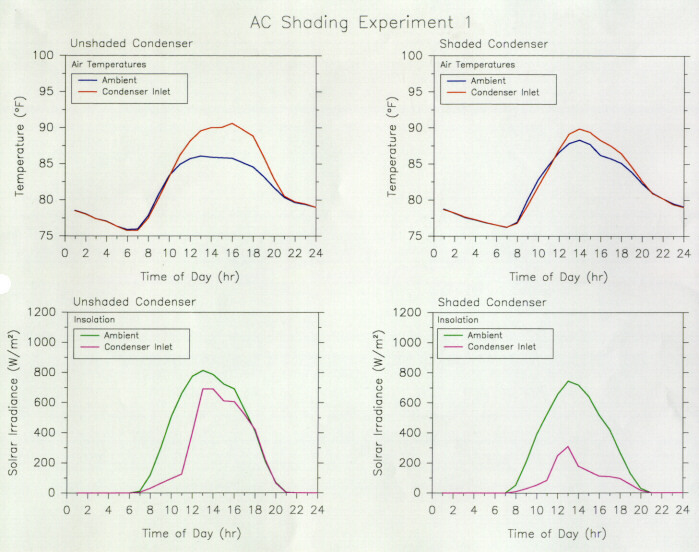 AC condensers were shaded at mid-summer after a period of base-line data was collected. The landscaping or shading devices were installed to provide as much afternoon shade as possible, but to obstruct air flow as little as practical into and out of the AC condenser. All of the AC units were fully exposed on the west faces of the three homes. Thermostats and operation of the systems were held constant to eliminate this source of variation. The first experiment was conducted in a single family home in Merritt Island, FL with a conditioned floor area of 1,490 ft2 (138 m2). The air conditioner was a GE BTB730A166A1 2.5-ton (8.8 kWt) split system with a SEER of 7.2 Btu/w (COP=2.1). Rated condenser air flow was 3,000 cfm (1475 L/s). The home was instrumented in late May, 1993 with data then taken on roof top meteorological conditions as well as those in the immediate vicinity of the AC condenser. Landscaping was installed on July 12, 1993 after four weeks of data collection. Three trees were planted as shown in figure 4. Two of these were 8-foot (2.4 m) Wax myrtle trees (Myrica cerifera) and the larger specimen was a 10-foot (3.3 m) Live Oak (Quercus virginiana). The trees were located to provide a shade pattern with maximum afternoon coverage of the condensing unit and surrounding area, while not interfering with the upward exhaust air flow pattern. Also, a thick bed of mondo grass (Ophiopogon japonicus) was planted around the base of the condensing unit. The plants were automatically watered for an hour each evening to establish healthy growth and encourage transpiration cooling during daytime hours. Figure 4. 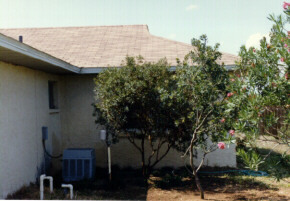 West-facing condenser at site 1 prior to landscaping (top). Final appearance after tree planting (bottom). Using three-week pre- and post-periods with similar weather conditions (temperature and solar irradiance), a reduction in the maximum afternoon summer temperature by the condenser inlet was measured to be approximately 3.3 oF + 0.1 oF (1.8 + 0.06 oC) relative to ambient conditions at 5:15 PM. The simple average reduction over the daily cycle was 1.0 oF + 0.1 oF (0.6 + 0.06 oC). 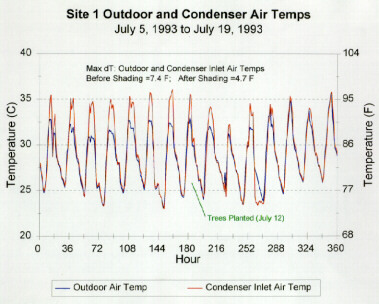 Figure 5 shows the measured ambient air and condenser temperature profile during the week before and after the landscaping was planted. Figure 6 shows the measured reduction in the temperature and insolation by the condenser from the shading when measured over two long-term periods with similar average weather conditions (ambient air temperature within 0.2oF and solar radiation within 10 w/m2). Figure 6. Plot of three week temperature and insolation profiles before and after landscaping at site 1. As expected, the major differences were observed in the afternoon hours. Unfortunately, energy savings could not be measured in the experiment since the control thermostat developed a drift which lowered the interior temperature during the post treatment period and made a meaningful comparison impossible. A second experiment was conducted on a 1,800 ft2 (167 m2) home also in Merritt Island, Florida. The air conditioner was a packaged heat pump with a rated EER of 9.9 (COP=2.9) and a cooling capacity of 29,000 Btu/hr (8.5 kWt) at standard ARI conditions. The packaged unit was of particular interest because both the horizontal exhaust air from the condenser was affected sufficiently by the landscaping to produce some mixing of the exhaust and inlet airstreams, thereby increasing the input air temperature to the condenser. 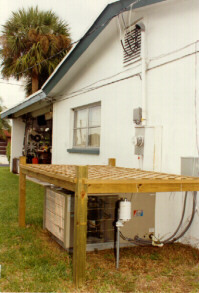 For this experiment a simple wooden overhead trellis was constructed to shade the packaged AC unit as commonly advocated by consumer publications (Koon, 1989). Six weeks of pre-retrofit AC and weather data were collected with the shading device installed on August 14, 1993. 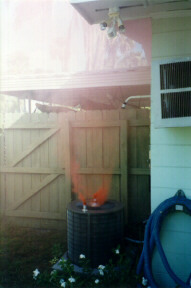 The inlet air was drawn from the sides and exhaust air was expelled horizontally away from the house. The inlet air temperature was not reduced significantly over the 24-hour cycle (0.04 + 0.1oF or 0.02 + 0.06oC). However, a maximum difference of 0.3 + 0.1oF (0.17 + 0.06oC) was observed at 4:30 PM and a reduction in coincident energy use was observed when differences in weather related conditions were considered. The small energy savings may be attributable to reduced direct solar gain to the air handler section of the packaged unit which was exterior to the house and directly exposed to the sun. The configuration is depicted in figure 7. Figure 7. Trellis shading device built over the condenser at site #2. The packaged unit draws air through inlets on each side and exhausts air horizontally from the house. In the third experiment, landscaping was again extensively used. The test was performed in the summer of 1994 on a 1,700 ft2 (158 m2) single family home on Merritt Island. The air cooling system was an older packaged 3-ton (10.6 kWt) heat pump with an approximate SEER of 7 Btu/W (COP=2.1). 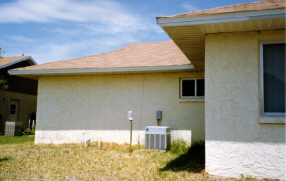 The unit was located on the west side of the home as shown before and after landscaping in figure 8. Four 8-foot (2.4 m) Crape Myrtle (Lagerstroemia indica) trees were planted on July 11th. Figure 8. West-facing AC condenser shading at site 3 before landscaping (top). 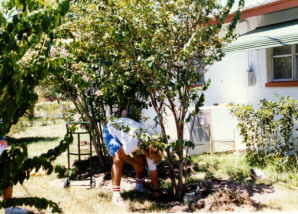 Planting of four Crape Myrtles for shading (bottom). The plants were situated to provide maximum afternoon shade of the AC condenser unit while particular care was taken to ensure that neither intake nor exhaust air flows were impeded. An automated watering system was set up to provide drip irrigation during evening hours. However, contrary to the previous experiences, the temperature around the condenser rose above ambient (0.7 + 0.1 oF or 0.4 + 0.06 oC) after the landscaping was installed. The difference was greater between 12 and 6 PM (0.9 + 0.1oF or 0.5 + 0.06oC). Controlling for before and after weather conditions, air conditioning electrical consumption also rose by over 15%. The magnitude of this change is much larger than expected and is still unexplained. In spite of the attention to maintain free air flow, we speculate that the horizontal exhaust air from the condenser was affected sufficiently by the landscaping to produce some mixing of the exhaust and inlet airstreams, thereby increasing the input air temperature to the condenser. Table 1 summarizes the results obtained from the three experiments. Reductions to temperature and insolation are those measured near the condenser relative to those measured at the roof-top meteorological station. AC savings are not available for site 1 due to the problem associated with the thermostat control during the post treatment period. The probable explanation for the lower than expected performance in the experiments is that outdoor AC units draw in a volume of air that greatly exceeds that of the nearby shaded air volume. Air-cooled condensers move a quantity of 600 - 1200 cfm of air per ton (80-160 L/s/kWt) of cooling capacity (ASHRAE, 1992). For instance, a typical 3-ton (10.6 kWt) air conditioner's 300-W condenser fan would draw 2,800 cfm (1321 L/s) of air at a very low static pressure across the coil (Proctor et al., 1994). Thus, the unit would process 168,000 cubic feet (4.76 x 106L) of air per hour. Assuming no mixing, this would represent a volumetric equivalent to a cube of air with sides measuring 55 feet (16.8 m). Our experience also illustrates the hazards of localized condenser shading, underscored by the poor results achieved in these experiments relative to the careful planning involved. Planting trees and shrubs close by a condenser may actually reduce system efficiency due to impedance of effective air movement. We conclude that any savings produced by localized AC condenser shading are quite modest (<3%) and that the risk of interrupting air flow to the condenser may outweigh shading considerations. The preferred strategy may be a long-term one: locating AC condensers in an unobstructed location on the shaded north side of buildings and depending on extensive site and neighborhood-level landscaping to lower localized air temperatures. Abrams, D.W., Low Energy Cooling, Van Nostrand Rheinhold, New York, 1986. Akbari, H., Davis, S., Dorsano, S., Huang, J. and Winnett, S. Cooling Our Communities: A Guidebook on Tree Planting and Light-Colored Surfacing, 22P-2001, U.S. Environmental Protection Agency, Washington D.C., January, 1992. ASHRAE, 1992. HVAC Systems and Equipment Handbook, American Society of Heating, Refrigerating and Air Conditioning Engineers, Chapt. 36, Atlanta, GA.
Baird, D.C., 1995. Experimentation: An Introduction to Measurement Theory and Experiment Design, Third Edition, Prentice-Hall, Engelwood Cliffs, NJ. FPL, 1989. "Landscape Planning," Publication MC-8912-89/2225M, Vegetation Management Program, Florida Power and Light Company, Miami, FL. Geiger, R., 1957. The Climate Near the Ground, Harvard University Press, Boston, MA. Heisler, G., 1977. "Trees Modify Metropolitan Climate and Noise," Journal of Arboriculture, Vol. 3, No. 11, p. 201-207. Huang, Y.J., Akbari, H., Rosenfeld, A.H., and Taha, H., 1987. "The Potential of Vegetation in Reducing Summer Cooling Loads in Residential Buildings," Journal of Applied Meteorology, Vol. 26, No. 9. Huang, Y.J., Akbari, H and Taha, H., 1990. "The Wind Shielding and Shading Effects of Trees on Residential Heating and Cooling Requirements," ASHRAE Transactions, Vol. 96, pt. 1, Atlanta, GA.
Kline, S.J. and McClintock, F.A., 1953. "Describing Uncertainties in Single Sample Experiments," Mechanical Engineering, January, 1953, p. 3. Koon, C., 1989. "Grow Your Own Savings," Missouri Resource Review, Vol. 6, No. 2. McGinn, C., 1982. "Microclimate and Energy Use in Suburban Tree Canopies," Ph.D. Thesis, University of California, Davis, CA. Meier, A. K., 1990. "Measured Cooling Energy Savings from Landscaping," Proceedings of the ACEEE 1990 Summer Study on Energy Efficiency in Buildings, American Council for an Energy Efficient Economy, Washington D.C.
Neal, L. and O'Neal, D., 1992. "The Impact of Residential Air Conditioner Charging and Sizing on Peak Electrical Demand," Proceedings of the 1992 Summer Study on Energy Efficiency in Buildings, Vol. 2, p. 189, American Council for an Energy Efficient Economy, Washington D.C.
Parker, J.H. "Landscaping to Reduce the Energy Used in Cooling Buildings," Journal of Forestry, 81 (2), February, 1983. Parker, J.H. "The Impact of Vegetation on Air Conditioning Consumption," Proceedings of the Workshop on Saving Energy and Reducing Atmospheric Pollution by Controlling Summer Heat Islands, Berkeley, CA, p. 45-52, 1989. Proctor, J., Katsnelson, Z., Peterson, G. and Edminster, A., 1994. Investigation of Peak Electric Load Impacts of High SEER Residential HVAC Units, Report 008.1-94.2, prepared for Pacific Gas and Electric Company, San Ramon, CA. Sonne, J.K., Vieira, R.K. and Rudd, A.F., 1993. "Limiting Solar Radiation Effects on Outdoor Temperature Measurement," ASHRAE Transactions, Vol. 91, Part 1, American Society of Heating, Refrigerating and Air Conditioning Engineers, Atlanta, GA. In attempting to understand why the shading of AC condensers may not provide the benefits envisioned by others, we discovered a possible opportunity for improving air conditioner efficiency which has been little quantified. Our results underscore the importance of establishing unobstructed air flow from air cooled condensing units. Given the close proximity of the inlet and exhaust flow areas of residential air cooled condensers, it is important to insure that the exhaust air plume projects cleanly away from the unit. For condenser units with top exhaust, the exhaust air flow is extremely turbulent (characterized by high Reynolds numbers), but sufficiently rapid to reach conditions of reasonable throw at exit. However, as with most fan flows, the exhaust air flow pattern is not fully developed at the point of exhaust and can be strongly affected by surrounding building geometry. Recent FSEC experiments using colored smoke candles for flow visualization, suggest that even small obstructions in the exhaust jet may easily induce eddy currents in the flow vortex which result in recirculation of air from the exhaust to condenser inlet. For optimal performance, the results suggest that AC condensing units should be located several feet away from overhangs, vegetation or other obstructions that would impede or deflect the exhaust air flow. Although AC manufacturers commonly specify minimum clearances for condensing units away from walls and overhead obstructions, the experiments so far conducted indicate that these values may be based more on practicality than for providing optimal performance. 1. Obviously, efficiencies in typical air conditioners are subject to limitations of the vapor compression cycle as well as motor efficiencies for the compressor, condenser and evaporator fan drives that degrade performance to levels considerably lower than indicated by the ideal Carnot cycle. 2. It seems unlikely that AC condenser shading can be cost justified on the basis of energy savings. The installed cost of the installed landscaping at site 1 was $569 and $440 at site 3. The materials for the shading trellis at site 2 cost approximately $40, although allowance should be made for the five hours labor necessary for its construction.